Akkanvader (あっかんべえだあー, lit. 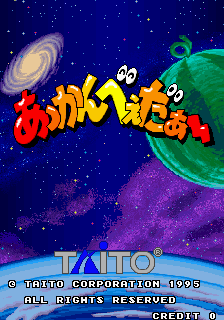 Akkanbēdā), released under the name of Space Invaders '95: Attack of the Lunar Loonies outside of Japan, is a fixed shooter arcade game which was released by Taito Corporation in 1995; it runs on the company's F3 hardware, and is the seventh title for their Space Invaders series. Like 1990's MJ-12, it features several different types of invaders and special weapons - but it has redesigned them to make them look "cuter" (a possible inspiration from anime). Players must take control of two of ten different ships: Teketeke 1 and 2 (piloted by humans, "Dan" and "Mayumi"), Kusai-Wa 1 and 2 (piloted by two anthropomorphic turds, "Benben" and "Penpen", Poribaketsu 1 and Danboru-Bako 2 (piloted in by an anthropomorphic dog and cat, "Wanko" and "Nyanko"), Silver Hawk 1 and 2 (piloted by humans "Clyde" - not that orange ghost, from Namco's Pac-Man - and "Bonnie"), & Goriyaku Ichi and Kaiun Ni (piloted by "Sayo-Chan" from KiKi KaiKai and "Miyo-Chan"). The visuals are reminiscent of Konami's Bucky O'Hare which was based on the short-lived television series of the same name, and you can now hold down on the Firing Button to charge your shot (like Apollo's sword in Namco's Phelios); upon releasing the button, your chosen ship will fire a more powerful shot up at the invaders. There are now also bonus stages, which are reminiscent of those in Namco's Galaga (as opposed to the "Cattle Mutilations" from MJ-12) - and also like MJ-12, there are "boss" invaders (and that second one has its own Darius-type warning).